Competitive fly fishing techniques and gear for the mainstream angler. If you've found our site then you likely love to fly fish. While fly fishermen and women like to tout that fly fishing is much more than just about catching fish (and it is), I doubt there are many of us who wouldn't like to fill the net with a few more fish each day. This site is dedicated to helping you do just that. We've lived in the world of competitive fly fishing for over ten years, where catching one more fish is often the difference between a medal and a finish in the middle of the pack. Even if you don't compete, one more fish may be just the way to cap off your day on a positive note. We often have a hard time leaving without just one more.....And you never know, that one last fish might be the one whose memory and photo hangs on your wall for a lifetime. We want to help you catch that fish and make that memory. By imparting our hard earned knowledge of domestic and foreign competition-inspired fly fishing and tying tactics, and supplying you with the gear needed to master them, we aim to make your days in the water more productive and, in turn, more memorable. We promise that the gear we sell is the gear we use. It's the gear we trust to give us a competitive edge and we believe you can trust it too. I started fly fishing at age 9. I will never forget my first day where I caught a cutthroat on an ant in the first meadow of the famed Slough Creek in Yellowstone on a hand me down fiberglass 7 weight! Though I’d been fishing with hardware since I was a toddler, that day started an addiction to fly fishing that I can't seem to shake. When I fished against Lance Egan and Ryan Barnes in the former Outdoor Life Network’s Fly Fishing Master’s in 2004, I knew I had to find a way to compete in the sport I loved. It was serendipitous that I worked with both these anglers a year later after they had made Fly Fishing Team USA. I fished in my first regional and made the team myself in 2006. The ensuing years have been more educational than I could have ever imagined and I'm as hopelessly obsessed with fly fishing today as I've ever been. This obsession has brought dedication, which has helped me to have competitive success domestically and abroad. The year 2017 marked my 9th consecutive berth as an angler for Fly Fishing Team USA in the 37th Fips Mouche World Fly Fishing Championships in Slovakia. In 2015 I was incredibly fortunate to finish with the individual bronze medal and even more fortunate to have been a part of the squad that won the first team medal (a silver) for the USA at the world fly fishing championship in Bosnia. In 2016 we followed that feat with a team bronze in Vail, Colorado. Fly fishing competitions have exposed me to tactics and techniques from incredible teammates and fellow fly anglers from across the globe. Away from competitive fishing, fish have sculpted my professional life as well. I hold a bachelor's degree in ecology and a master's degree in fisheries science and spent 3 years working as a fisheries biologist before taking on Tactical Fly Fisher as a full time business in 2017. I have a wonderful wife Julia of 12 years, a four year old son Levi whose favorite fish are bull trout, and a 10 month old daughter who shows early signs of fly fishing virtuosity. What more could a guy ask for? Glade blames his Father for his love of fly fishing. It only took one trip on the Little Bear River 30 years ago to hook him for life. His real job is based in Tulsa, OK, where Glade works in New Business Development for Cytec Industrial Materials. His four kids love to go fishing and camping with him no matter the occasion. Glade was first exposed to competitive fly fishing by helping Lance Egan at a regional competition in 2009 as a controller. The effectiveness of competitive techniques inspired him to learn more. He fished as often as possible Lance Egan and Devin Olsen and to prepare and began entering competitions. 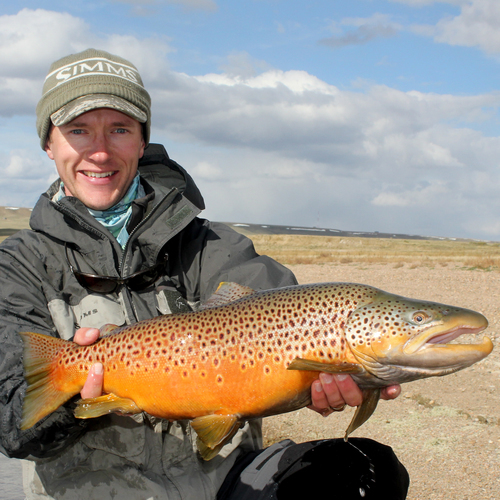 Glade earned a spot on Fly Fishing Team USA in 2012 and enjoys the camaraderie, challenge, and love of fly fishing that being a part of the Team brings. 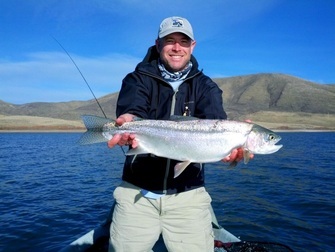 He takes regular opportunities to share his love of fly fishing with others through fly fishing clinics, fly tying classes, and participation in community fishing programs. He currently resides in Riverton, UT.